For every client you want to manage, it will produce it's own log of related services. As related data been verified and analyze, this is where Kibana package come to picture as it can helps to visualize and manage the relevant data to a proper view or combine it into desirable glossy dashboard for easy understanding. For this tutorial, I am using CentOS Linux 7.4 in the 64bit version. In this tutorial we will use 3 server: The first one will be used to as the management server and the other 2 will be used as clients. For this exercise, we will use the management server to monitor an existing MySQL service which already has been setup, configured and running under each client. As MySQL is a database service which is used mainly for OLTP purpose, we will make our management server to log 2 logging processes which is the health check of the MySQL service itself and the slow query transaction. By the end of this tutorial, we will see that any information logged from any MySQL service inside dedicate client can be seen,visualize and analyze simultaneously from the management server directly real time. Connecting to artifacts.elastic.co (artifacts.elastic.co)|107.21.237.188|:443... connected. As shown above, we've decided to log 2 logging process from MySQL service which is the healthcheck of the database itself and the slow query log. Notice on the above that we've set an IP address for the logstash host which is 172.17.0.6 .This IP is the address for our centralized management server which will crawl directly to collect the logging data. I've set the hardcoded IP as I didn't make any alternative changes under /etc/hosts file and didn't use any DNS server for this tutorial. Yet, feel free to use the hostname of the management server if you've did make the alternative changes. 2018-06-09T12:45:18.813Z INFO instance/beat.go:301 filebeat start running. 2018-06-09T12:45:18.814Z INFO registrar/registrar.go:71 No registry file found under: /var/lib/filebeat/registry. Creating a new registry file. 2018-06-09T12:45:18.819Z WARN beater/filebeat.go:261 Filebeat is unable to load the Ingest Node pipelines for the configured modules because the Elasticsearch output is not configured/enabled. If you have already loaded the Ingest Node pipelines or are using Logstash pipelines, you can ignore this warning. 2018-06-09T12:45:18.840Z INFO cfgfile/reload.go:219 Loading of config files completed. Notice that once you startup the filebeat service, there's an error shown under the log. This was due to the management server that been assign was not setup yet. For initial phase you can ignore the error log as it will automatically recovered once our management server has been setup and started to crawl. As configuration for client base are done, you can continue replicate the steps on the other MySQL server that also act as client. Moving forward, we will continue with setting up the management server itself. Now as we've done setting up for client side readiness, let's startup the configuration needed for the management server itself. As per brief, there are 3 core packages that needed to be install and configured for management server which is ElasticSearch , LogStash and Kibana. Done, in order for ElasticSearch to work, it require Java to be setup. Below are the steps on installing and configuring Java into the server. [[email protected]_master config]# wget --no-cookies --no-check-certificate --header "Cookie: gpw_e24=http%3A%2F%2Fwww.oracle.com%2F; oraclelicense=accept-securebackup-cookie" "http://download.oracle.com/otn-pub/java/jdk/8u131-b11/d54c1d3a095b4ff2b6607d096fa80163/jdk-8u131-linux-x64.rpm"
Connecting to download.oracle.com (download.oracle.com)|23.49.16.62|:80... connected. Connecting to edelivery.oracle.com (edelivery.oracle.com)|104.103.48.174|:443... connected. Changing password for user shahril. Once done, log in as the user and you may start the elasticSearch services. 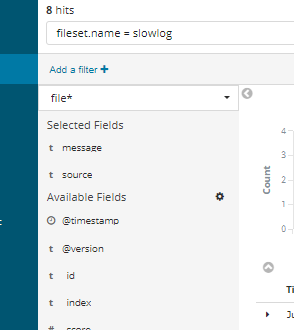 Connecting to artifacts.elastic.co (artifacts.elastic.co)|107.21.253.15|:443... connected. Noted that from the configuration made above, we've set the input to be taken from filebeat service in client side which using port 5044. 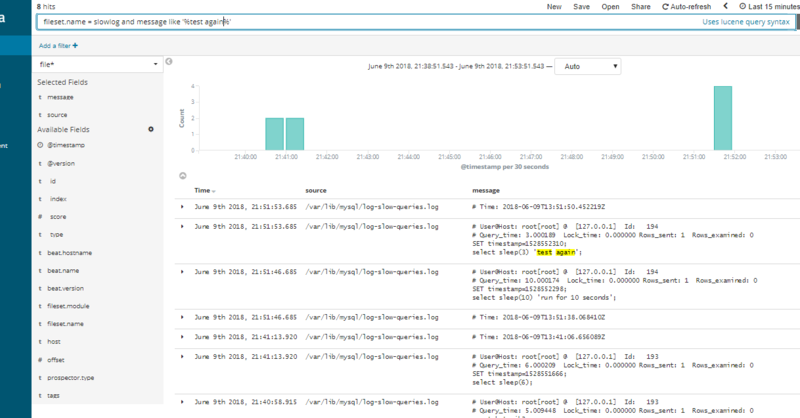 We also have set a proper annotation for logstash to align the raw data that taken from each client side. 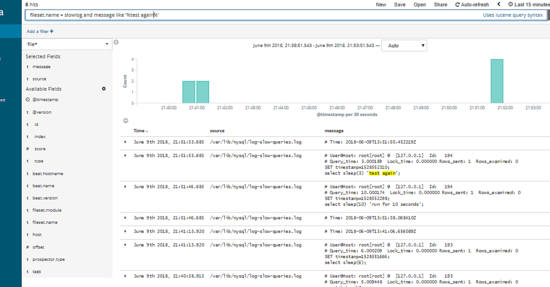 This is needed so that it would be easier to be viewed and analyze from elasticSearch side. Next, we need to install filebeats module for logstash so that logstash able to capture and crawling the raw data from client side. Jun 09 13:17:40 elk_master systemd: Started logstash. Great, now everything are up and running as per shown above using the netstat command. Now let's view the Dashboard of Kibana and made the configuration. Got to url http://172.17.0.6:5601/app , you'll see the dashboard will be shown like below. Next on the dashboard, click on Management tab then define the index pattern, for our cases the index pattern are define as our logging filename generated. Type in the information then click next. Excellent, now the management server are ready to be use. Let's proceed by testing the usability. As shown above, we've manage to produce some of slow query that automatically jotted into each client slow query log. Now, let's go to the dashboard and see if the data information successfully been crawl by centralized server and convert it as visualization graph. Using the textfield on top of the dashboard, you can type in SQL query related to view certain information or part of the data needed. 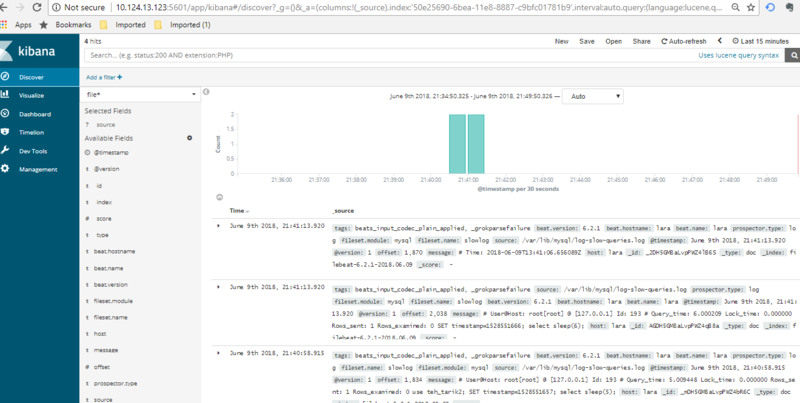 Excellent, as show above the slow query SQL that we've produce initially from 1 of our client server automatically shown under our Kibana Dashboard per expected.